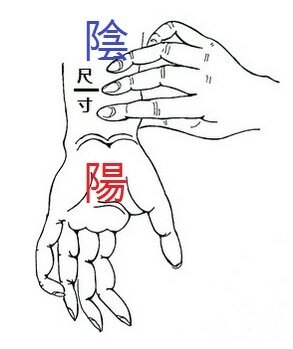 ​It explains that there are the yin and yang areas of the pulse on the wrist. 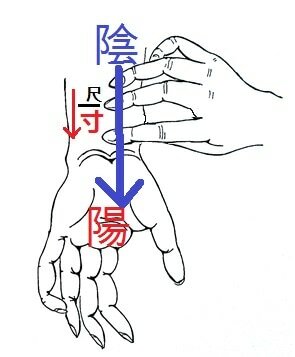 One area from guang line of the middle finger position towards elbow or under annular finger position is yin. 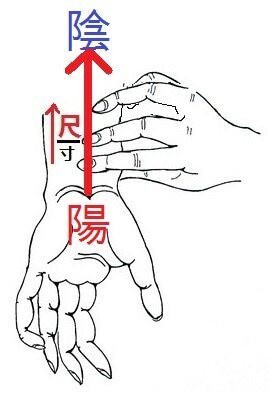 Another area from guang line under middle finger position towards wrist crease or under index finger position is the yang. 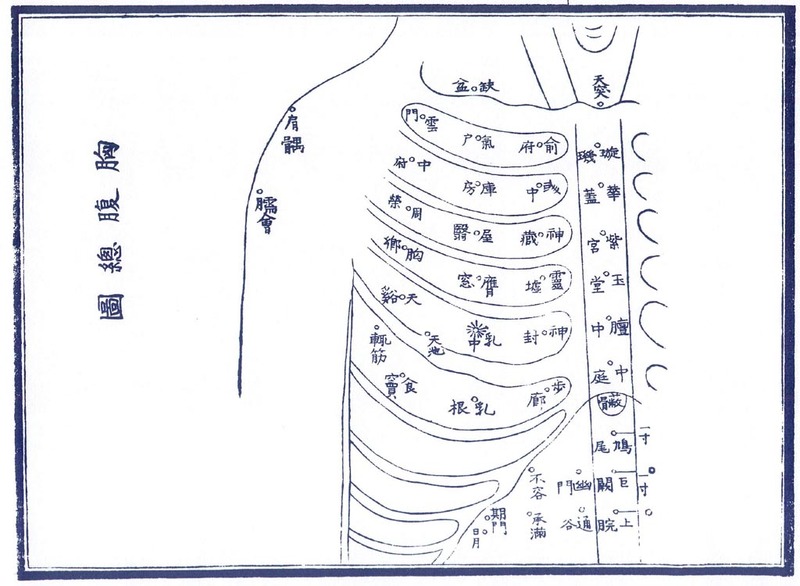 If we look to the pulse map which we use for archaic pulse guided acupuncture treatment, so we can see that the lung pulse is more superficial or more yang, when kidney pulse is more deep or more yin. It shows that yin increases from yang towards yin and yang increases from yin to wards yang. Same way Large intestine pulse is more superficial or Urinary Bladder pulse is more deep, making Large intestine pulse to be more yang and Bladder pulse to be more yin. 1 Lung yin excess or yang deficiency needed to be treated by dominating yang victory trough lung mu point. 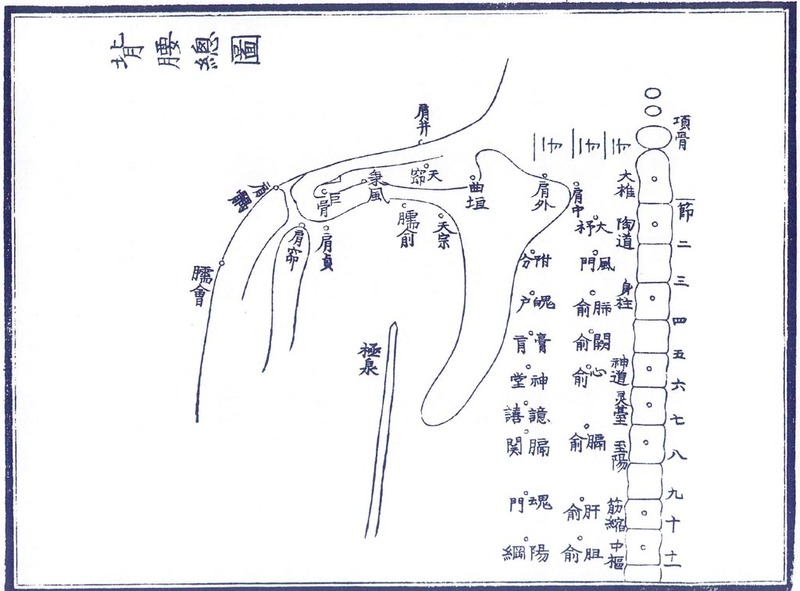 In this case dominating yang from yang victory goes to the yin mu point decreasing yin of the lung and increasing it's yang. 2 Heart yin deficiency or yang excess needed to be treated by dominating yin during yin victory through the shu points. In this case dominating yin from yin victory goes towards the yang shu points, decreasing yang of the heart and increasing it's yin. 3 Stomach yang deficiency or yin excess needed to be treated by dominating yang from yang victory through mu point. In this case dominating yang from yang victory goes towards yin mu points decreasing yin and increasing yang of the stomach. 4 Gall Bladder yang excess or yin deficiency needed to be treated by dominating yin from yin victory through back shu points. In this case dominating yin yin from yin victory goes towards yang shu points decreasing excess of yang and increasing yin. we treat them accordingly to their movement using natural yin and yang victory which move towards yang and towards yin too.